My first rural Franconian beer experience some ten years ago. A wonderfully powerful beer with a very full body and a bitterness on the dry side. Now I've also sampled the Keller version of the beer, and I'm more impressed than ever. Not only is the Keller a very pleasant drinking spot - the beer itself has unique qualities! I love the combination of lightness, softness and bitterness. The beer is absolutely clean, but far from bland. This is how a real Franconian beer should taste. 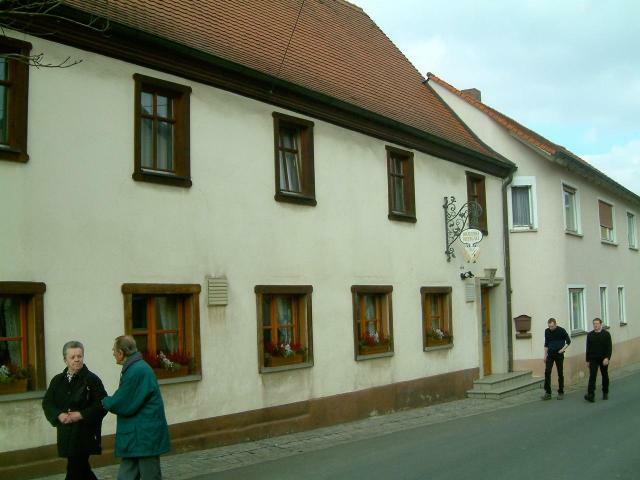 I first visited Brauerei Witzgall in July 1988 on a Thursday its Ruhetag day. However because i was with with a friend who had been before we were invited to sit outside with the locals and drink this excellent ale which I scored 5 stars. I scored it this high not only because it tasted superb but also that because it was its closing day and also the day they brewed Helmut Witzgall the owner would not take any money for the 4 or 5 half litres we consumed. On the 4 times I have been back since, the last being 2 years ago, the beer still tasted excellent even though this time we had to pay for it. First visited this excellent Brewery in 1988 with 2 friends on a cycling tour of the area. The pub was offically closed for its Ruhetag (Thursday). This was its brewing day. However because one of the party had been before Helmut Witzgall recognized him and we were invited to sit down and join him and a few other locals for a beer or two. We did not pay for a drink for the next couple of hours or so even though we did make efforts to do so. The beer then was one of the best I ever tasted and when I last visited two years ago still remains one of my personal favourites. He only brews a Vollbier for the pub but does brew another beer for his beer garden on the edge of the village which I believe is only open on a Sunday morning in summer. We visited in 2003 with 9 people. The local were very friendly. One elderly gentleman, Herr Laurence, had apparently been there since opening and bought the ladies a round of very sweet wine. He then promised to cut the guys' hands off if we touched the ladies! The landlord called his wife on the phone and he behaved after that. Very funny! The landlord gave us a tour of the brewery and was very friendly. The beers were quite good. Vollbier: smooth quick drinking, maltier than a pils, hoppier than a marzern, very clean. As it was sunny and balmy, we sat in the yard behind the brewery and the pub, where most locals were that day. They only had the Völlbier from the tap, which was a fun quaff, but nothing as challenging as their Landbier, which was served from the bottle. I liked the latter so much that I asked to bring back a bottle, which the friendly matron gave me for free! Great conversations with the curious locals, very good beer, relax atmosphere, what more could you want from a Franconian countryside brewery? -Great bobbing foam recedes swiftly into the krug. -Grapefruity, spicy (gingery? ), and herbal hops form a seductive perfume. -Grassy, peppery hop bitterness surveys the back of the tongue for quite a while. -The tropical fruitiness functions efficaciously with the hops. -Active, but soft carbonation serves the delicate body well. -A marriage of complexity, and tasteful drinkability. -Golden clarity benefits but from a veil of head. -Fresh cereal and caramel politely entice. -Effervescent carbonation is still softer than the usual gassed up lager, but evokes a frail body in this particular case. -Simple-minded maltiness is still effective. -Finishes softly, with whispering hop bitterness. -This doesnt evoke Franconian lagers at all, strangely enough. A beautiful village brewery that brews quite oldfashioned beers. We sampled the Helles and the unfiltrated beer. Both were quite complex. The Helles was full-bodied, oily and heavy with lots of hop. One of the best of its class, I think. The unfiltrated beer seemed even more hoppy, but very smooth. Recommended! Something must have changed. Vollbier ok but filstered and quite gassy. Disppointing. Though still a place on the Franconian map to place a pin, there is only a Vollbier now on tap. While it is a rich golden malty brew with some nice cereal notes, it doesn't evoke classic Franconia in terms of dry and fruity. I was here in 2002 and it seems the beer was "better" then than it is now. That said, we enjoyed sitting in the rear garden area with a small number of locals, drinking a very quaffable beer at 10:30 in the morning. The owner gave me a huge pile of new coasters when I asked him if I could have one clean one to bring home! Evidently, they still brew an unfiltered kellerbier for their nearby keller but it has very infrequent opening hours. If I ever get back to this area, I'll try to time myself accordingly. This area is very accessible with the Bus 265, which is included with the Bayern Ticket.